Last night I decided to give myself time off for good behavior. After being on my feet all day, I did what people down through the centuries have done when they’re too tired to cook: ordered Middle Eastern food. Or at least that’s what our ancestors would have done if they’d known the joys of hummus, tabouli, baba ganoush, falafel, and lentil-rice dish thingy and had had the Mediterranean Grocery and Café right down the street. Alas, folks, it was not fat-free. Now you know: I’m human, too! To make up for last night’s laziness, bright and early this morning (around 9) I got up and decided to cook breakfast. I’m not normally a breakfast person; a couple of pieces of fruit suit me just fine. And truth be told, a Monterey Frittata is complicated enough that I usually serve it for dinner. So don’t try this on a workday morning. 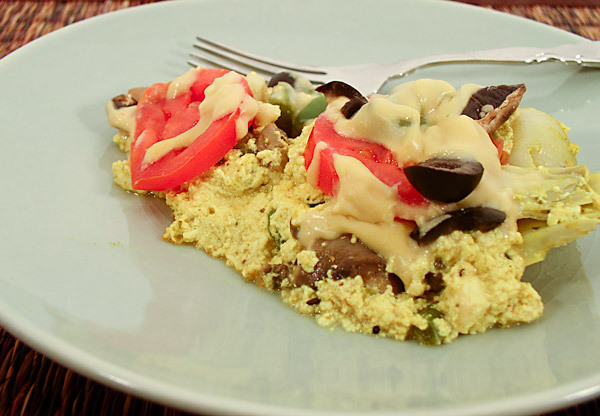 This vegan tofu frittata recipe was inspired by one on the back of the box of Fantastic Foods Tofu Scrambler. I’ve never been to Monterey, so I don’t know why this frittata is named after it, but I liked the sound and decided to keep the name. 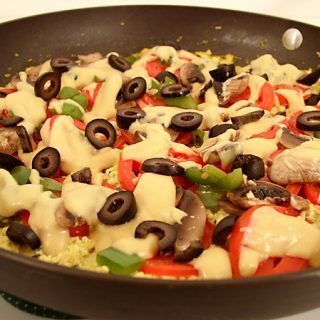 I used Tofu Scrambler for years before deciding to put together my own scrambler mix, so if you want to save time and use the bought version, you won’t hurt my feelings. Mash the tofu and add the seasoning mix, green onions, and artichokes. Set aside. Heat a tablespoon or so of water in a small non-stick saucepan; add the mushrooms, green peppers, and garlic and cook until the mushrooms exude their juices. Drain the liquid off, and add half the mushroom mixture to the tofu. Heat a large non-stick skillet to medium-high. Add the tofu, and stir and cook it for a couple of minutes. Then flatten it, pressing it evenly over the entire pan. Cover, reduce the heat to medium-low, and cook for about 10 minutes. While it’s cooking, make your Cheeze Sauce. Blend all ingredients together in a blender (I actually use a hand blender and do it right in the pan) and pour into a saucepan. Heat it at medium-high, stirring constantly, until it boils and thickens. Add enough water or plain soymilk (a couple of tablespoons) to make it just pour-able. Keep it warm until ready to use. Once the tofu is heated through, place the sliced tomatoes on top, and sprinkle the remaining mushroom mixture over them. (If you’d like, you can add vegan parmesan at this point, too.) Drizzle cheeze sauce over the top, using as much or as little as you’d like. (I use about 2/3 of the recipe and reserve the rest for another use.) Sprinkle black olives over the cheeze, replace the cover, and cook until the tomatoes are done (about 5 minutes). Slice carefully, and serve. Or better yet, put your feet up and have someone serve you! Hi – I’ve been loving your new blog. About the Monterey frittata – I think its called that because the artichoke capital of the world, Castroville, is right outside of Monterey. The recipe looks fantastic and I’m definitely going to try it. How do you get your pictures to look so professional? I’m compiling pictures of all my recipes and I’d like to make them look just as good…assuming they actually do look good 🙂 Thanks! Isil, I’ve never seen tofu in a jar! Here it’s in plastic containers in the refridgerator (well, mostly). I’d like to see that some time. Denise, thanks for the info about Monterey. It definitely makes sense. Amko, I’m so glad you like the photos! Here are my top three tips: 1–turn off the flash and set yourself up in a place with good light, preferably natural light; 2–get up close and use the close-up mode; 3–use a tripod to hold the camera steady. For more about taking photos, you can Google “food photography” and find lots of good info. Good luck! Hey Miriam, if you modify it, please let me know what you did. I’m always looking for new ideas. Harmonia, I made a really terrible cheeze fondue the other day, so I’m no stranger to disasterous recipes. This one is pretty disaster-proof, though, so I hope you give it a try. isn’t bryanna the best? i just love her recipes. Somehow we screwed this up and it turned out pretty runny. I was able to feed it to two of my non-veggie housemates anyway. I’ve been tofu shy in the past, but this was actually pretty good. Just to say the link to the Bryanna Clark Grogan website doesn’t work any more. 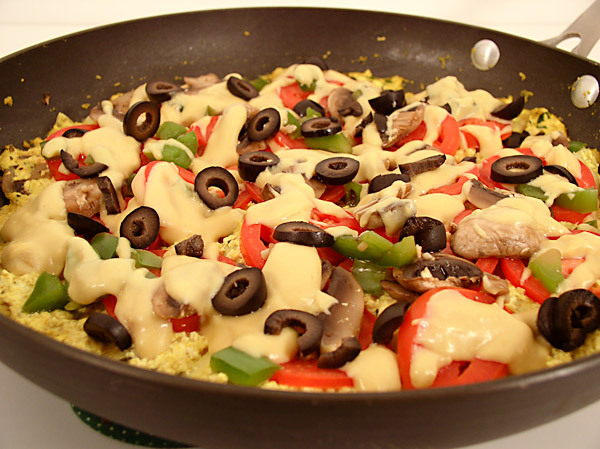 But I’m really looking forward to making this for myself – it would be really good to master a vegan omelette, and a cheeze sauce that really work. Just to mention something about instant mashed potato flakes. I was reading the labels on some boxes the other day and there is milk in them. Thanks Susan for this–the Monterey Frittata from the back of the scrambler package is a favorite of mine (and my DH and son-even though they don’t know it’s made with tofu!) — and of course I couldn’t find my recipe, nor a package with the recipe on the back. You saved me! Appreciate finding an old favorite!